During the Vietnam War (1961–75; a civil war between the communist North and the democracy-seeking South), North Vietnamese guerrillas found cover in the lush jungles of South Vietnam. To deprive their opponents of hiding places and food crops, the U.S. military instituted a program called Operation Ranch Hand, which involved the aerial spraying of herbicides. Ground spraying from boats, trucks, and backpacks occurred as well. 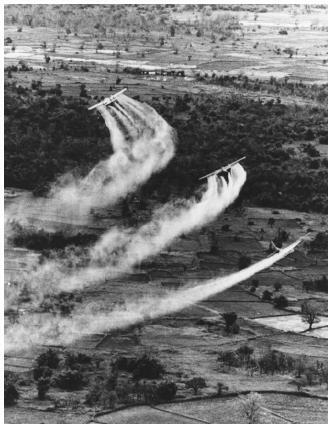 In all, U.S. troops sprayed approximately 19 million gallons (72 million liters) of Agent Orange and other herbicides over 4 million acres (1.6 million hectares). This military strategy is thought to have saved the lives of many U.S. combat soldiers who had been sent to fight on behalf of the South Vietnamese. Chloracne: A rash of skin lesions on the face, neck, and back caused by exposure to TCDD. Herbicide: A chemical substance used to destroy or inhibit plant growth. Hodgkin's disease: A type of cancer characterized by enlargement of the lymph nodes, spleen, and liver and with accompanied weight loss, heavy sweating, and itching of the skin. Mangrove: Tropical coastal trees or shrubs that produce many supporting roots and that provide dense vegetation. Non-Hodgkin's lymphoma: Tumors that develop from cells in lymph nodes, bone marrow, spleen, liver, or other sites in the body. Soft-tissue sarcoma: A rare but varied group of tumors that arise in the muscles, connective tissue, inner layer of skin, bone, and other tissues. Toxicity: The degree to which a chemical, in sufficient quantities, can poison humans and other organisms. Concerns about the health effects of exposure to Agent Orange were initially voiced in 1970, following a study that reported the incidence of birth defects in laboratory mice given high doses of the herbicide 2,4,5-T. TCDD, a dioxin contaminant of 2,4,5-T, was isolated as the actual cause of the birth defects. A commission established in 1970 to study the effects of herbicides on the ecology and population of South Vietnam reported that herbicides had not only destroyed vegetation and food, but 2,4,5-T and its associated dioxin contaminant might possibly have caused birth defects among South Vietnamese people who were exposed to it. On April 15, 1970, all use of 2,4,5-T in the United States was suspended, except for the killing of weeds and brush on non-crop land. On May 9, 1970, Operation Ranch Hand flew its last mission in Vietnam, and U.S. forces stopped ground spraying in 1971. The herbicide was banned completely in 1985 by the Environmental Protection Agency. Toxicity of TCDD. TCDD is a by-product of the manufacture of trichlorophenol, a chemical used to produce 2,4,5-T. Workers involved in accidents or spills at factories where the herbicide 2,4,5-T is manufactured have developed a condition called chloracne, a rash of skin lesions on the face, neck, and back. After researchers developed a method to produce trichlorophenol with a reduced level of TCDD as a by-product, the number of chloracne cases among factory workers in the herbicide industry decreased substantially. The toxicity of the dioxin contaminant TCDD is the subject of continuing controversy and study. While some animals are very sensitive to TCDD, others are more tolerant to it. A very small amount can kill 50 percent of guinea pigs exposed to it, but a dose thousands of times larger is needed to cause the same number of deaths in hamsters. Serious health symptoms reported in 1977 by veterans of the Vietnam War spurred both the White House and the Veterans Administration (VA) to institute studies to evaluate the possible long-term health effects of herbicides and contaminants. Exposure to TCDD in humans is measured by the amount of the contaminant found in blood and fatty tissue, where it tends to accumulate. Studies determined that levels of TCDD in the blood of chemical plant workers were strongly related to length of time of exposure. Inadequate records of herbicide spraying and troop movements have made it difficult to determine to what degree individuals were exposed to herbicides and TCDD in Vietnam. Ranch Hand personnel who were heavily exposed to Agent Orange had significantly higher TCDD levels than other veterans. The average TCDD concentrations of Vietnam veterans who might have been exposed to Agent Orange on the ground did not differ significantly from that of other veterans and civilians. regarding health effects, the NAS instead reviewed existing studies of people known to have been exposed to herbicides. In 1993, the 16-member panel of experts classified possible health effects in four categories, depending on the degree to which they could be associated with TCDD exposure. In a 1996 update, the Institute of Medicine (IOM) reported new evidence upholding the 1993 finding of sufficient evidence of an association between TCDD exposure and various disorders with symptoms including tumors and skin lesions, including soft-tissue sarcoma, non-Hodgkin's lymphoma, Hodgkin's disease, and chloracne. Porphyria cutanea tarda (a rare skin disease) was downgraded from sufficient to "limited/suggestive evidence of an association," a category that also includes prostate cancer, multiple myeloma (cancer of bone marrow cells), and respiratory cancers (cancers of the lung, larynx, or trachea). The IOM also reported there was new "limited/suggestive evidence" to show an association between TCDD exposure and the congenital birth defect spina bifida (incomplete closure of the spinal column at birth) in Vietnam veterans' children. A neurological disorder suffered by veterans was also placed in this category. The remaining two categories include cancers or disorders that have insufficient or no evidence of an association with TCDD exposure. The damage to the plant life of South Vietnam caused by the spraying of Agent Orange is still visible today. The most severe damage occurred in the mangrove forests (tropical trees and shrubs) of coastal areas where spraying left barren, badly eroded coastlines. The number of coastal birds declined dramatically, and with the disappearance of the web of water channels beneath the mangrove trees, fish were deprived of important breeding grounds. It is estimated that full recovery of the man-grove forests to their former state will take at least 100 years. The loss of commercially useful timber due to aerial spraying of Agent Orange over dense inland forests was significant. About 10 percent of the tall trees making up the forest canopy were killed. Smaller shrubs now comprise the majority of vegetation in affected areas. Tussock grasses and bamboo replaced woody plants destroyed by the spraying. The beginnings of natural recovery can be seen, but it will be many years before the forests will approach their former productivity. As the rich, diverse tropical forests disappeared, so did animal habitats. As a result, the number of bird and mammal species living in the areas that were sprayed declined dramatically. Wild boar, wild goat, water buffalo, tiger, and various species of deer became less common once the cover and food resources of the forest were removed. Domestic animals such as water buffalo, zebus (an Asian ox), pigs, chickens, and ducks were also reported to become ill after the spraying of Agent Orange. The contaminant TCDD is not easily or quickly broken down in soil, and there is concern that herbicide residues might inhibit the growth of crops and other plants. These by-products, which can be toxic, could then be passed to humans through the food chain. i am writing an article about the effects of the war in Vietnam and i found this article really helpful. Im looking into my exposure to agent orange that deals with my seizures. I need to find out medical information dealing with this issue. That is the only reason for my seizures that comes close to a bonafide explaination. Where do I find out any research on this subject. I spent 20.5 months in VietNam and to this day I can still remember the spraying of agent orange, the stickyness, and the taste of it, but not the health problems of it. Can you tell me where to look for medical information?. I need to really find out medical information. Thank you for your time. I am looking for information and maps about spraying agent orange between Pleaku and Kontum. If you have any, would you please share it with me? My husband also has seizures which we can find no explanation for except Vietnam/Agent Orange. I've always wondered whether anyone else out there who served in Vietnam has been plagued with this terrible condition. He served in DaNang in '71 and can remember them spraying. I don't know why the VA has not added this condition to their list. Everyone knows that being exposed to toxins will cause seizures. Veterans who was in vietnam should not have to prove they stepped foot on land in order to get compensation.We was there that was enough. We at the time could breath Gods wonderful air without a machine to breath for us. In my last six months with the 64th transport co.We supplied operation Lom-Son.The South Viet-Nam Armys push into Loas.I've had several tumors removed,all on my left side.From my left temple to my left knee.I would like to hear from anyone who suffers from the same.Thank you,and welcome home brothers and sisters.I also served in Korea where i hear they sprayed agent orange. IS IT TRUE THAT AGENT ORANGE WAS ALSO SPRAYED IN HARLEM TO SEE WHAT THE EFFECTS WERE TO HUMANS? I HEARD THERE WERE SECRET GOVERMENT STUDIES OF AGENT ORANGE ON IT'S CITIZENS. AND IF SO WHERE CAN I FIND THIS INFORMATION. I can not believe that the Americans did not take responsibilities for what they did to the Vietnamese. And they arent even givving money to people who are still suffering from the affect of Agent Orange. Once I researched about this topic, I am very surprised about what I've learned. I can not believe how much the Vietnamese is suffering right now. I've been having seizures for years. Currently it's under control pharmaceuticly. I was in Vietnam from 1968 until 1969 with the 1st Infantry Division. Now my grown children are starting to experience seizures. There's no history of seizures in my family in any direction. This is a hell of a legacy to pass down through my generations. Not the way I wanted to be remembered. This article has been extremely helpful! It may seem like there should be tons of valid information on agent orange on the internet, but I have not found much, and most deal exclusively with the veterance, so it is nice to see some of the ecological effects and to know that there is somebody else who does not only have sympathy towards the veterans, the ones who were causing these problems by sprayiny the agent orange. I never got to know my father him and mom my split up when I was 3. from what my mom tells me he was a vet. he was 101st airborne. i have no way of being able to get any info out of him. he died a few years ago about 3 years ago i started having seizures and the doctors have no answers for me. is there anyone else out there that had a family member in vietnam that now has seizures? also does anyone know if there is a test the doctors can do to see if it is the agent orange that is causing them? I am now about to turn 40 my dad served in marines in Vietnam. He's currently disabled and we are beginning to wonder if any of my health problems are due to being born so soon after he returned and I don't know where to look. Confused AND desperate for answers to help my health. I am doing a lengthy project on the ecological effects of agent orange. Do you know any web sites or such with lots of detailed info regarded the vegetative effects? thank you! Thanks my god father died because of this stuff i was doin a research paper on it. I Lois Bettina Bellamy (Hoskins) was marry to Gary E. Hoskins Sr. in the 70's, but before marriage we were together a lots of years even before Mr. Hoskins was in VietNam, then he reinlisted for some months in (1969 & 1970. I have a daughter in (1970) and than me and Mr. Hoskins got marry and had a son (Gary Edward Hoskins II/1972). Then in (1976) Mr. Hoskins & I got a divorce, but when Gary came home he has told me a lot about things that went over in VeitNam including how agent orange effected him and some other. Then when the papwk concerning Agent Orange later on in years came, Gary brought them over for me to read. Mr. Hoskins said he would take care of what everthing. So every now and than I would ask Gary, is there anything I should know. As time went on I just start trying to check into it myself, but as you know, I have never got anywhere because I have not heard from anyone there. I really would like information concerning this Agent Orange, due to the effects that I have heard that it has had on soliders and other. As a member of Widows on a Warpath, I know personally the ill effects of such a deadly chemical. The fight is long and a difficult one with the Government of Canada to accept all conditions and illnesses, diseases that the IOMS have on their list. Lets face it the effects on the human body would be the same no matter where you lived or worked when there is Agent Orange being sprayed. We are continue to fight for all victims of AO deadly chemical spraying at CFB Gagetown. Now Northern Ontario faces the same fate. The spraying must stop and the government of Canada needs to be accountable and compensate all victims by providing health care, and funding. We have lost many loved ones to this travesty and will continue to face the same for our loved ones still living. We did not ask to be a posioned population and we are not going to take it anymore. We are not going away. My dad has lung cancer and many other health issues, he is a Vietnam Vet. My sisters and I all have some type of muscle disorder, lung and other health issues. My eldest sister had a stroke when she was 18. We are grateful she survived. I want answers but I don't know who to ask or where do I go for the answers I seek. Please email me at erikamd127@gmail.com if you have any real answers about Agent Orange; and if the government will help my dad with his many medical issues. My husband in Vietnam 7th Infantry 1966-67. He was exposed to AO day in and day out. They were in the field search and destroy for weeks on end. He has had complex partial seizures for the past 5 yrs at least, we finally had it diagnosed in 2008. He has been controled with medication, however we are always held to close schedule of meds at a regular times and always wait for the other shoe to drop. He is now on cumadon for blood clot in leg, and recommendation for life. High BP and several other issues, skin rash on arms and legs, usually at the beginning of summer when first nice sunny days (he never wears cut off but he has itchy rash on legs as well. We are in the process of VA Comp, God only knows, this is a real process. I will communicate if someone thinks it will help them. I have read several posts mentioning neurological problems associated with either presumptive or possible AO exposure. I have suffered from CNS problems for decades and long suspected Toxins I may have been exposed to. There have been other health issues that I have discovered are related to AO Exposure, including cancer diagnosed at a fairly young age for that type of cancer. Also, a condition known as chloracne as well as a lot of sebaceous cysts. Then I found out AO was tested at several locations in CONUS, including Ft Gordon where I spent several months. I urge anyone who thinks they were exposed to contact one or more of the Veterans Service Organizations. Both the DAV and AMVETS have been helpful to me in securing disability. I have no proof that any of these are linked to AO. Just a very strong suspicion. If anyone out there can show a link between seizures and exposure to AO or TCDD, please let us know. I was in Vietnam from 1966 to 1967. Within the last two years, I have had six surgical procedures. Four surgeries due to a cerebral spinal fluid (CSF) leak believed to be caused by cysts in my spine. The other two surgeries were to remove an enlarged lymph node in my right underarm and the most recent surgery to remove an enlarged lymph node in my neck. The first removed lymph gland was benign. I am presently awaiting the lab results for the lymph node on my neck which was removed two weeks ago. Could these conditions be a result of my exposure to Agent Orange? My family physician, having read a lot of medical research pertaining to Agent Orange, believes there is a distinct possibility these are related to my tour in Vietnam. It's appropriate time to make some plans for the loegnr term and it is time to be happy. I've read this put up and if I could I wish to suggest you few interesting issues or advice. Perhaps you could write next articles relating to this article. I wish to read more issues about it! My husband died with a brain tumor and it wasn't disnagosis as nature and he was given 30 pills and die 4 hours later in a private hospital. I was given the wrong disnagonis for his death by the medical examiner and I am in the process of appeal the discisons and amend the death report. The informations is very helpful to me and other veteran's widow. The veteran aren't being inform of their entitlement benefits and their children are suffering with the same disease. My dad was a medic in Vietnam. He recieved information on an agent orange lawsuit. what about the children conceived after these men came home? As a baby into my teens i had seizures and since the age of 3 dealt with imobilizing migraines . Is there any research or proof to link these. if so, where? because it has been passed into my children as well. I was in northern South Viet Nam in the 68-69 time period and traveled all over the area from Danang to the DMZ in support of I Corp operations. I have Type II diabetes and over the last couple years I have experienced several skin cancers and unknown skin tumors. I have recently sent a claim to the VA to address these cancers. They have asked me to prove that my cancers came from my exposure. Anyone have recent studies in this area? Can anyone verify if Agent Orange was ever stored at Roosevelt Roads, Puerto Rico? If so, in which warehouses was it stored?